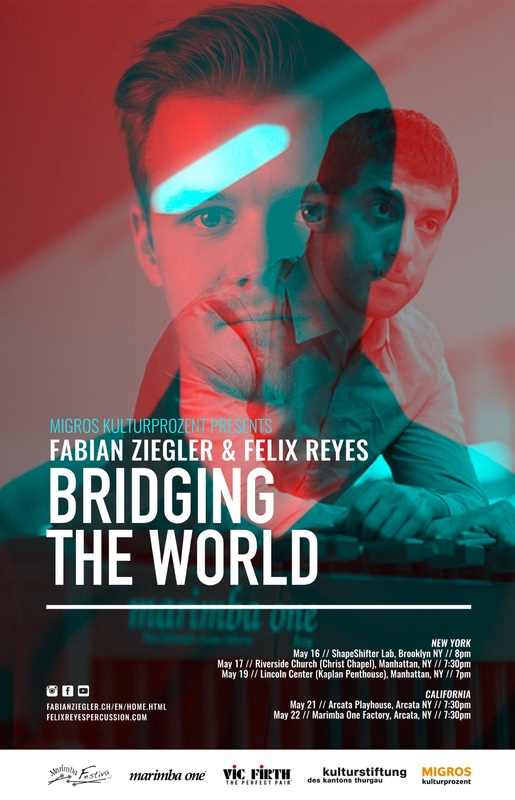 As part of a collaboration with Migros Kulturprozent and Marimba One, both up and coming percussionists Fabian Ziegler (Switzerland) and Felix Reyes (USA), have been organizing together performances throughout New York City, and Arcata, California. This concert series came as an initiative to perform and introduce chamber works for marimba/percussion to audiences who may not be familiar with this growing art form. The works that will be performed range from classical contemporary composers such as Emmanuel Sejourne, Maurice Ravel, Rainer Furthner, Alejandro Vinao, Nicolai Gerassimez, Iannis Xenakis, John Psathas, Christos Hatzis, Casey Cangelosi, and Bruce Hamilton.